Detail : Paul's twenty-fourth solo single. 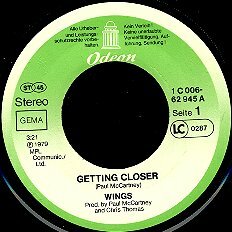 The LAST Wings single, and therefore the last release to feature the above line-up was declared as a double A-side. unfortunately this release did nothing to boost album sales, failing miserably in the chart. 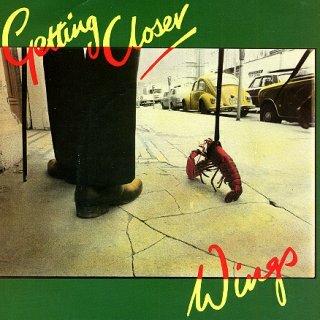 It was taken from a 1978 book entitled Work of Hipgnosis - Walk Away Renee, and was listed under "Unsold Ideas". 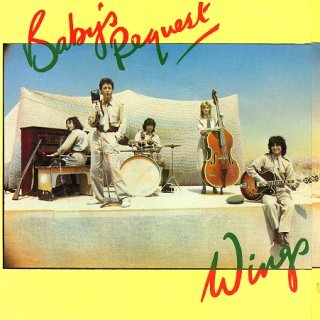 The rear picture was a still from the promotional film for "Baby's Request". The label is once again a "fried egg", with no apparent record label name ... except a reference to MPL, and the Parlophone "R" type number. which had been on the U.K. B-side of "Old Siam Sir". Also it had a picture cover in the style of "Old Siam Sir", with the fried egg taking pride of place on the outside. I also show the label below, as it did NOT have the fried egg. The German catalogue number is 1C 006 - 62945.